I could never be a spy, but how lovely to think that I can cook like one! 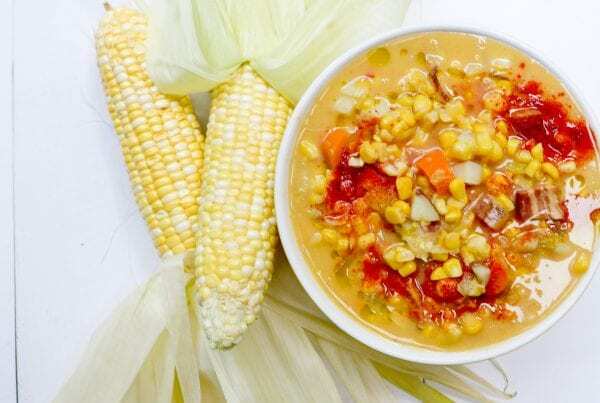 Cabbage soup or “Shchi” has unfortunate associations: scant and watery prison fare, bland and tasteless staple of the Soviet tourist hotels, or just something you cobble together when you want to slim down quickly. It doesn’t have to be like that. My friend Max once said that after a spoonful of my Cabbage Soup. “And this confirms it — you’re working for us aren’t you?” He tapped the fingers of his right hand on imaginary epaulets on his left shoulder, a gesture in Russia, which denotes association with Russia’s infamous Secret Service. “You’ve been binge watching too many episodes of The Americans,” I protested, trying to appear both modest and enigmatic. I felt absurdly proud of myself as Max slurped up his large bowl of soup, and silently held his plate out for seconds. It doesn’t get much better in the food business than this: I could never be a spy, but it’s nice to think I can cook like one. 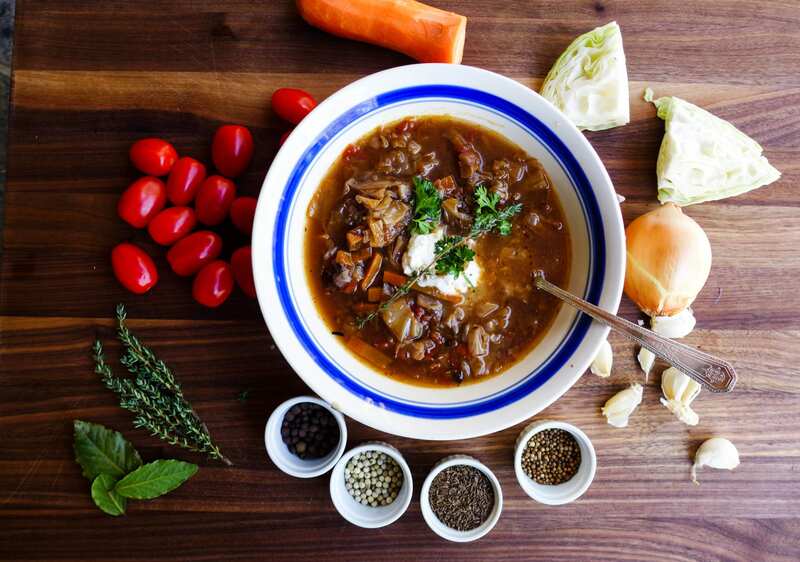 Cabbage soup or “Shchi” in Russian, is a notoriously tough culinary nut to crack. Readers of the more angst-ridden vein of Russian literature recognize it as a permanent fixture on prison or gulag menus. Tourists to the Soviet Union in the 1970s noted that it made a depressingly frequent appearance at bland and tasteless Intourist lunches. In the decadent and godless West, cabbage soup resorted to by ladies-who-don’t-lunch as a last ditch effort to drop a dress size. 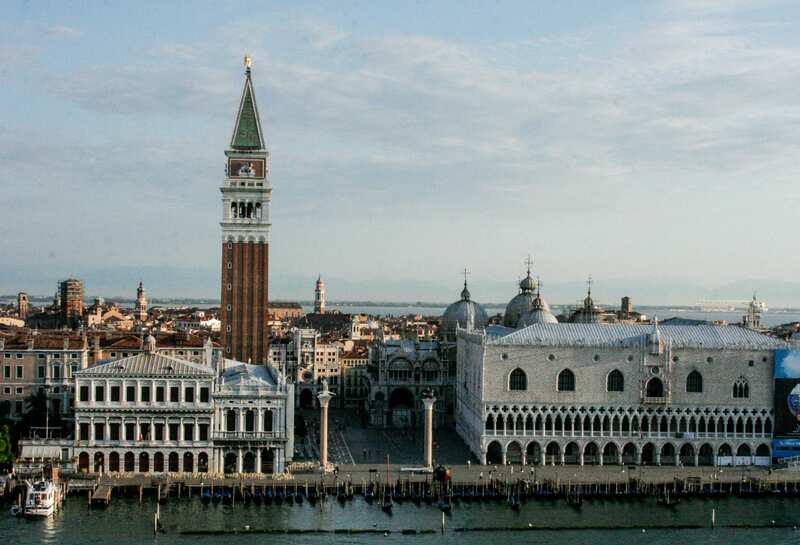 With inspiration like this, is it any wonder Shchi has got itself a bum rap outside of Eastern Europe? Today marks the end of the triple whammy of Catholic Christmas, Soviet New Year, and Russian Christmas. Thank God. I’m more than ready to go on the “Pisha Nasha” diet for a while. Old New Year is firmly behind us, so it’s time to bin the dying Christmas Tree and purge the fridge of all the decadent holiday fare. I pulled out all of the stock bags from the freezer, filled with the remains of holiday joints and roasts, tops and tails of vegetables, cheese rinds and other kitchen remains to simmer on the stove while I crank up the oven to its highest roasting setting. It’s Shchi Time! Done right, Shchi is neither watery, nor tasteless, but a delightfully hearty soup, bursting with dominant umami flavors of cooked root vegetables spiked with a tang of fermentation. Thick and filling, Shchi can beat back the coldest, rawest days January can serve up. The state secret of Shchi lies in the preparation. Like all peasant soups, Shchi was cooked “low and slow” on a “pechka” or stone stove which stood at the heart of all peasant dwellings. 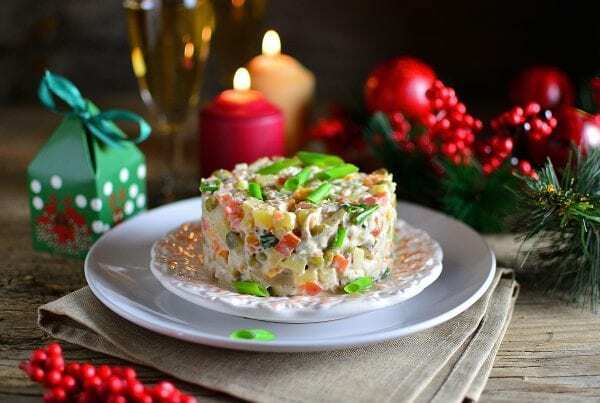 During the autumn and winter, the fire in the pechka burned continuously, emitting a steady heat, ideal for simmering pots of soup, grains, and stews. The best way to imitate this method is in a slow cooker or a cast iron Dutch Oven on a low setting. But the real state secret (said she, tapping her fingers on her shoulder) is to roast the main vegetables — cabbage, carrots, and tomatoes — before adding them to the pot. By doing so, much of the water that is the scourge of Gulag “Soup of the Day” leeches out, leaving a base of nutty, umami cabbage with accents of sweet, caramelized tomatoes and carrots. 1. Preheat the oven to 400℉ and adjust the oven rack to the middle height. Line a baking sheet with parchment paper. 2. Cut the cabbage into ”wheels” of approximately 3/4-inch thickness and arrange them on the baking sheet. Brush the cabbage with 1 Tbl of olive oil, 3 of the minced garlic cloves. Sprinkle with salt and several generous grinds of the pepper mill, and place a sprig of thyme on each. Toss the cherry tomatoes in 1 Tbl of the olive oil and and sprinkle with salt and pepper. Roast the vegetables for 30 minutes. Remove from the oven and set aside until the vegetables come to room temperature. When they do, mash the cherry tomatoes with a potato ricer and roughly chop the cabbage. Mash the garlic cloves with the back of a fork. 3. Prepare the spices by crushing the allspice berries, white peppercorns, coriander, and caraway seeds in a mortar and pestle. 4. 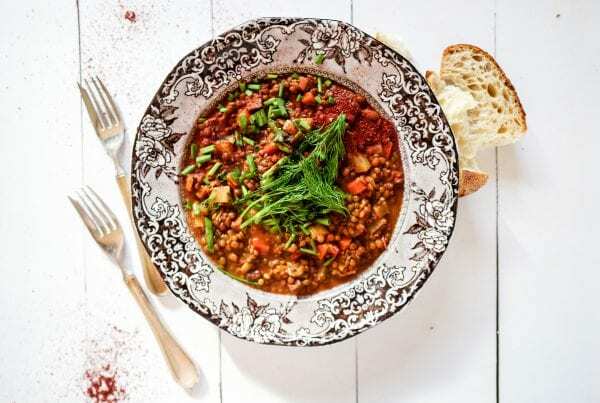 Heat the remaining olive oil in a heavy-bottomed saucepan or the heat-resistant ”ceramic” of a slow cooker. Sweat the remaining garlic and the onion until they are translucent. Add the carrots and toss until combined. 5. Add the spice mixture and cook for another minute. Reduce heat and add the tomato paste and sugar. Cook until the paste coats the vegetables. 6. Add the stock, cabbage, and tomatoes. If you are using them, now is the time to nestle the ham hock or beef shank into the soup mixture and add the potatoes. Add the bay leaves and thyme sprigs and set the slow cooker to 6 hours on ”low.” To imitate the slow cooker’s ”low and slow” functionality, place the soup in a large Dutch oven with a tight lid in a preheated oven at 200ºF (100ºC) for 5-6 hours. 7. When the soup is finished, remove the ham hock or bone-in beef shank bone. Scrape the meat from the bone, and add it to the soup. Discard the fatty tissue and bone. Remove the bay leaves and thyme twigs. 8. Add the kvass or pale ale and cider vinegar and stir to combine. Adjust seasoning with additional salt and pepper to taste. Then allow the soup to cool to room temperature. For best results, let the soup cool in a refrigerator overnight and the flavors to blossom. 9. Reheat gently over low heat and garnish with a dollop of sour cream and chopped parsley. 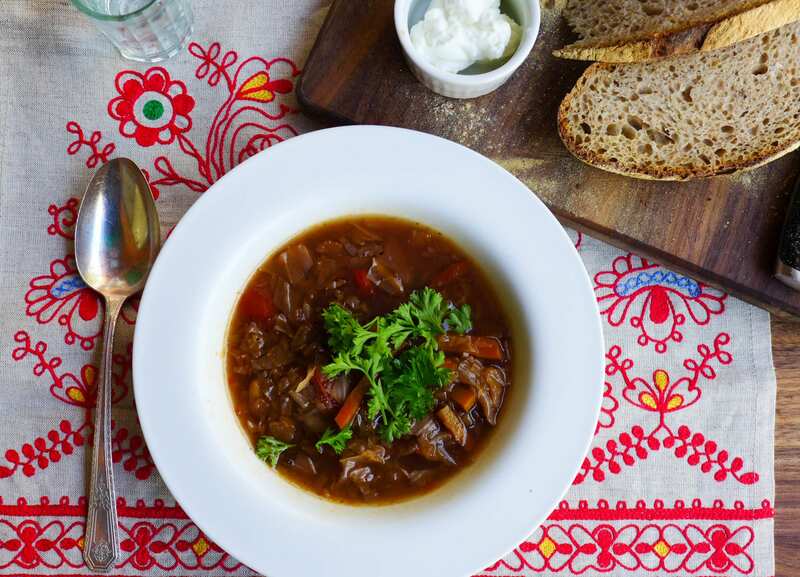 Serve with a hearty black bread and a shot of cold vodka, and you have a truly Russian meal! Although Shchi is marvelous as a vegetarian soup, a smoked ham hock, chunks of thick, streaky bacon, or a bone-in beef shank elevates this soup into a meal. The basic recipe above, like all Russian soups, this should be considered a template upon which you can endlessly riff, substituting and adding ingredients such as potatoes and parsnips, and additional spices as you such as paprika, cumin, savory, and others. 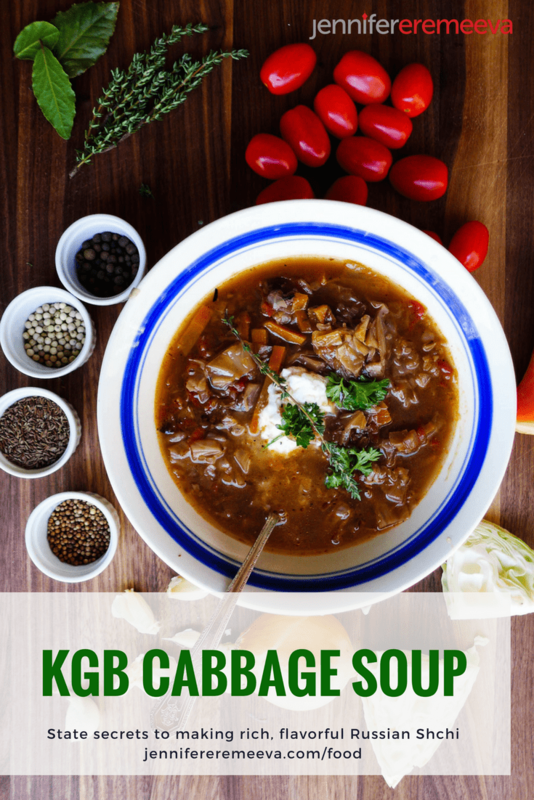 My first impression of a soup named “KGB Cabbage Soup” is one in which seconds is never an option. No matter how tasty. Now “SHCHI” is a soup I’ve enjoyed in Russia and Ukraine in both the Soviet time and post Soviet time. When prepared with effort and an appreciation for great food, it is a dish I would enjoy on a weekly basis. Even when it’s simply thrown together it can still be a tasty staple. I will be trying my hand this coming weekend at KGB Cabbage soup. Can’t wait. A hearty snow fall would make the day complete. Never added kvass to my Shchi before! I need to try this! Love allspice but hard to find here in Australia, so I don’t use it as often as I’d like! Love your Pinterest Pin!! !